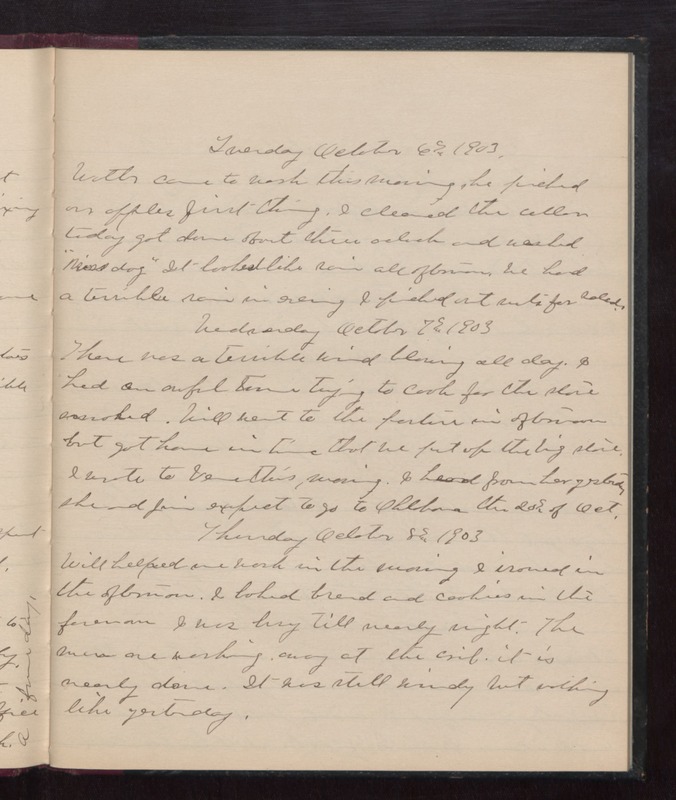 Tuesday October 6th 1903 Walter came to work this morning. He picked our apples first thing. I cleaned the cellar today got done about three oclock and washed "[miss?] dog". It looked like rain all afternoon. We had a terrible rain in evening. I picked out nuts for salad. Wednesday October 7th 1903 There was a terrible wind blowing all day. I had an awful time trying to cook for the stove smoked. Will went to the pasture in afternoon but got home in time that we put up the big stove. I wrote to Vene this morning. I heard from her yesterday. She and Jim expect to go to Oklahoma the 20th of Oct. Thursday October 8th 1903 Will helped me work in the morning. I ironed in the afternoon. I baked bread and cookies in the forenoon. I was busy till nearly night. The men are working away at the crib. It is nearly done. It was still windy but nothing like yesterday.